To maintain good balance, don't overswing. Watching a golfer whose swing shows good balance is a visually pleasing experience. A balanced swing looks graceful -- almost effortless. But improving your balance has practical shotmaking benefits as well. Golfers who maintain good balance throughout the swing can generate maximum clubhead speed and are more likely to hit the ball squarely -- and solid. Make sure your stance is wide enough. Particularly with longer clubs, maintaining good balance requires starting with a wide enough base. The instruction book "Private Lessons" advises that when hitting a driver, the golfer's heels should be set outside -- wider than -- his shoulders. Taking a stance that's too narrow tends to throw a golfer off-balance, resulting in the clubface not returning to the proper square position at impact. Keep your weight on the inside of your right foot during the backswing (for a right-handed golfer). If you let your weight slide outside the right foot, you're likely to shift your lower body too far toward the target on the downswing. The club's movement will lag behind your leg movement and you'll hit the ball with the clubface open. To anchor his right knee during the swing, golf legend Jack Nicklaus slightly inclines the knee before he begins his swing and keeps the knee flexed as he completes the backswing. Maximize swing arc while not overswinging. To generate power, you want to make as full a shoulder turn as you can, but amateur golfers often lose their balance trying to achieve this goal. Your left heel should not come off the ground more than an inch as you reach the top of your backswing. 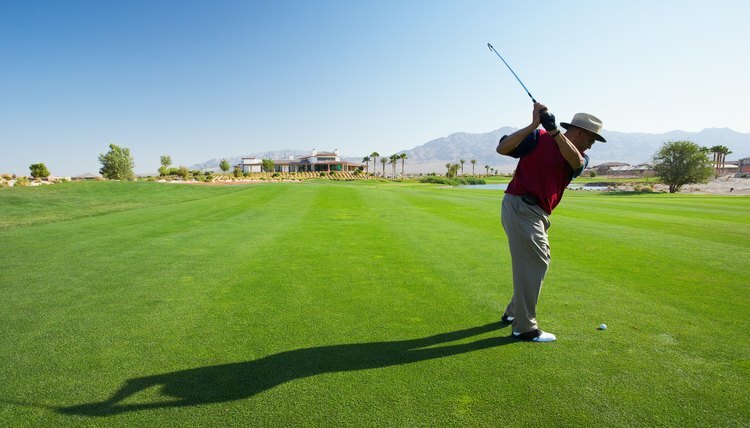 "Private Lessons" advises that when your shoulders turn as far as they can, that should be the top of your swing. Don't bend your left arm trying to lengthen your swing -- or strain to swing back so far that you move your head or let your torso tilt toward the target. Achieve a balanced follow-through. "The Golf Handbook" recommends that after you complete your follow-through, your weight should be balanced on the heel of your left foot and on your right toes.